Just wanted to add this little note...the CCSO is exhausting every possible possibility in this case. They have gone through mounds of trash, swam & examined alligator infested waters, searched the swamps, and we have been kept up each night with the choppers circling the outer areas (which brings them to my neighborhood here which is a good 12-15 miles from Immokalee and the CCSO substation is less than a quarter mile from our neighborhood)...they have been flying for hours upon hours till 3am searching the wooded areas for this child. We have 3 neighbors who are CCSO'ers and they have been working all hours of the day in search of Adji and you can see it written on their faces each day the disappointment and upset when nothing is found. This is what I've been really worried about since he hasn't been found yet. I wouldn't think he could have wandered off so far that he wouldn't have been found by now. It is great to hear how many searchers are involved looking for Adji. I really feel so badly for his family. I just hope and pray he is still alive. Pray that Adji will be found and that the searchers have the strength to continue on. Dolce I very much appreciate your updates. IMMOKALEE, Fla. -- A southwest Florida sheriff's office is seeking volunteers to help find a 6-year-old boy who's been missing for a week. The Collier County Sheriff's Office said Adji Desir disappeared from a migrant farm worker village in Immokalee Jan. 10 after he went outside to play. The sheriff's office is asking for volunteers to come to an Immokalee park Saturday to pick up fliers they can distribute in their own communities. Hundreds of volunteers searched this week for the boy, who authorities said is developmentally disabled and has the mental capacity of a 2-year-old. The FBI has assigned special agents to help with the investigation. I'm praying that Adji is found today. Has there been any news? Anything more the searchers have to go on? IMMOKALEE — It’s a community that’s been at the center of national media reports since 6-year-old Adji Desir went missing last weekend in Farm Worker Village in Immokalee. But what is Farm Worker Village? To outsiders it’s just government-subsidized housing. Yet to the community’s residents, it’s home and a safe haven. Opened in 1974 as farm labor housing, Farm Worker Village has grown from the 150 original units in the first phase of construction to 641 units spread through five phases. The last homes were built in 2001. Renters at Farm Worker Village, which is operated by the Collier County Housing Authority in Immokalee, must be citizens or permanent residents. Legal temporary guest workers aren’t allowed to live there. And that helps strengthen the feeling of community. That feeling was evident one day late last week as kids played along Chadwick Circle in the village. Among them were Blanchard’s three boys, Junior, 11; Ernesto, 9; and Ted, 4. The youngest arrived from Haiti on Monday with Blanchard’s wife, Marie, 40, after years of going through the legal immigration process. Blanchard’s relief and happiness were evident as he described what a normal weekday would be like for his kids. Homework will get done right after school, he said, and only after the work is done can they have some fun. “My wife does not play,” Blanchard said with a grin. Through the eight years he’s lived in the U.S., all in Collier County, Blanchard said the connection felt by residents has remained the same in Immokalee and at the village. “I don’t think I want to go anywhere else,” Blanchard said. Blanchard’s next-door neighbor, Camilo Martinez, moved in five months ago with his family. The move was like coming home, said Martinez, 37. Born in Naples, and raised in Immokalee, Martinez said the moment he got his driver license he’d drive over to the village to visit friends and family. He agreed with Blanchard in saying that the “neighborhood feeling” has not changed. “We all know all our neighbors,” Martinez said. Both said Adji’s disappearance has shaken the community and that it’s not a reflection of how the community has been all these years. “This has never happened,” Martinez said of security for village residents. But like other areas of Collier County, Farm Worker Village has changed in recent years. Esmeralda Serrata, the Collier County Housing Authority’s executive director, said the village has undergone changes during the past 8 to 10 years. When it opened nearly 35 years ago, the majority of the population living in the housing was of Hispanic origin, which included Mexicans, Guatemalans, Hondurans, Puerto Ricans and others. What hasn’t changed, however, is the bond the residents feel. Serrata said the village has maintained a sense of family as it has grown— something the development shares with Immokalee. And many former village residents still maintain ties to their old stomping grounds. In the morning, it’s not uncommon to spot village residents giving each other a ride to work or into town ... it’s just what they do. Another typical sight occurs when Village Oaks Elementary starts and ends its school day across the road from the village. Throngs of neighborhood kids make their way to and from the school, slightly somber in the morning and more laughingly in the afternoon. Overall, Serrata said, there’s a common feeling of respect and humbleness among the village residents. It’s something else that makes the community stand out, she said. Barbara Mainster, executive director of the Redlands Christian Migrant Association, said the professional make-up of the village’s population also has changed. The association has two separate day-care centers in the community, the first of which opened in 1975, Mainster said. Serrata echoed that sentiment and added that a lot of the village’s families never before had to worry about their children’s safety. That changed when news of Adji’s disappearance spread through the development. As of week’s end, the search for Adji continued. “Everyone is fearful,” Serrata said. But through it all, Serrata said the residents have come together to help the authorities try to find one of their own. Interactive Map set up by NAPLES NEWS in order for those familiar with the area to edit the map leaving blue points of interest such as craw spaces, abandoned houses or buildings...you know the places that a child could hide or be hidden. The blue diamonds are areas that have been searched, as you can see the areas have expanded with each passing day. There is a make-shift memorial for Adji set up in Immokalee with well wishes of a safe return home. I will be going there tomorrow to leave a poster for him. If you would like me to add your words of well wishes please send me an email of what you would like to say to Adji and/or his family and I am happy to add it nicely to the poster. Email is in my profile, so no need to bother Klaas asking for it, its available for anyone who needs to reach me. This story is breaking my heart. I used to teach Special Ed for k-2 grades. (before kids). This little guy would have been one of mine. I pray for his safety and his homecoming. I pray for his mommy and step dad and grandma especially, as he was in her charge at the time. May Jesus protect him. Thank you guys. I just checked my profile and made sure that my email is available for those who want to send their wishes. I will note your IM and Perri. Its been a long day for me so far, my hubs was taken to the emergency room for poison ivy as it had made its way into an open wound he recieved in the search. He was given a shot and antibiotics and steroids, was told he has a staff infection on top of the poison ivy within his system. We were not aware of his deathly allergic status against PI...given these types of elements I am in constant prayer for Adji and wish him to come home soon. America's Most Wanted is to air the search for Adji tonight on the show. The public attention is awesome! Again thanks everyone for thier prayers, this family is one that greatly apreciates all of the help, they are not one ounce like the Anthonys. Thank you NRCG, I am making the poster to leave at the memorial, and then going to continue my support of this case from the computer for a bit, living vicariously through my father and LE neighbors who are nice enough to indulge my need for info (the kind that is tell-able). Its about Adji, and I am so excited that this story is getting the attention it deserves. I hope that whoever has taken him, if that is the case, comes forward and gives the child back to his family. Two little girls made the news last night giving their account of their last sights of Adji walking down the street towards one of the bridges over a canal. Much of the waters and lakes have been searched by boats and FFAWL. My prayers to you and your hubby also Dolce. And to all the searchers. I also hold a positive though that this boy is found safe and sound. May the grace of God be with the community and his family. Thank you for the updates. Take care of your loved ones Dolce. Dolce, I know you have your plate full, so I would like to tell you that you are an awesome woman. Babies on the way, siblings, a husband, etc. I don't know how you do it. THANK YOU for what you have done for this poor little boy. I wish I lived around there, I would go look for the poor lamb myself. I pray for him and his family every night. Breaks my heart. Thanks for all you and your family and LE are doing for this baby. Dolce~make sure hubby follows thru on ALL the antibiotics, staph infections can become VERY serious, and you and the babes need to take it easy. Don't overdo anything. I know you are such a compassionate monkey and it's hard to say no, but just take good care of yourself and family. 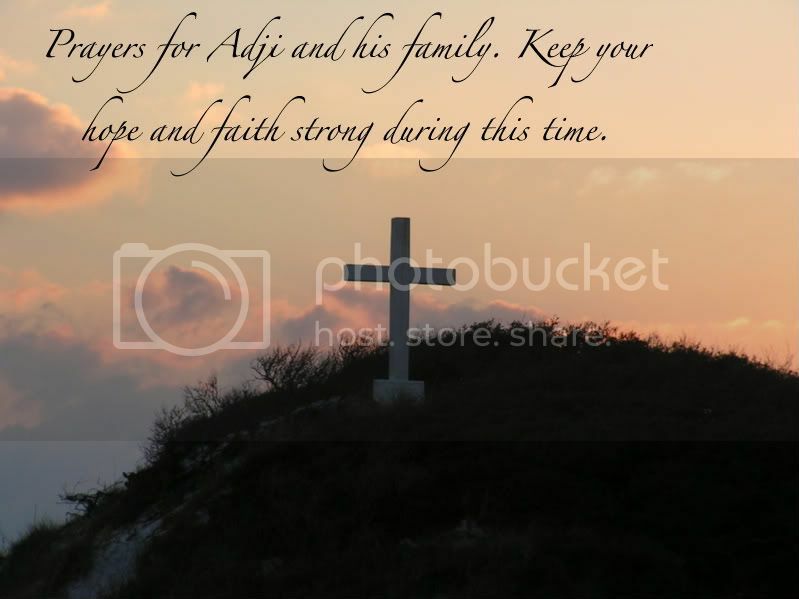 You, your family, Adji and his are in my prayers. I was reading Rob's post and was reminded of Jessica Lunsford. Close to the home. It was a Saturday. Have they interviewed the families there as to who had relatives or friends visit that weekend ? Someone who used to live there recently who wouldn't stick out ? Dolce, Thanks for the updates on Adji. I'm still praying that Adji is brought home safely. Also I'm adding your DH to my prayers for a fast recovery. Page created in 6.176 seconds with 20 queries.